Can a Stroke Cause a Personality Change? After suffering a stroke, many survivors experience not only physical impairments but also cognitive and emotional changes. In fact, about one-third of all stroke survivors will experience emotional difficulties, and many others may demonstrate personality changes or inappropriate behaviors. These shifts in mood and behavior are often difficult for both stroke survivors and their loved ones. However, effective treatment, healthy lifestyle habits, and taking the time to develop a new perspective will aid in coping with these new challenges. Every stroke recovery is unique, and each stroke survivor will have individual preferences when it comes to therapy styles and life changes. Today, community support groups are a proven pathway for many stroke survivors to discover what works for them, offering helpful insights and resources during the recovery process. Fortunately, there are many local support groups in cities across the country that can combat isolation and frustration and help patients deal with the changes — large or small — that often follow a stroke. There are two main types of stroke: ischemic and hemorrhagic. Ischemic strokes occur when the blood flow to the brain is blocked or disrupted by a blood clot. Hemorrhagic strokes, on the other hand, occur when a blood vessel in the brain ruptures, allowing blood to spread into surrounding tissues. Whether the cause is ischemic or hemorrhagic, personality changes after a stroke are common due to the subsequent neural tissue damage. Because different parts of the brain regulate and control different parts of our bodies and personalities, the location and severity of the stroke will determine the types of personality changes or impairments experienced by the stroke survivor. For example, many of our emotional responses, decision-making processes, and judgment abilities are controlled and regulated by the frontal lobes. If an individual has suffered a stroke affecting this portion of the brain, he or she may exhibit depressive symptoms and general apathy, or even lash out unexpectedly. These personality changes are subtle for some patients and dramatic for others. In some instances, an individual may become easily irritated or even act out violently. It’s common for more outgoing patients to become significantly more introverted following a stroke, or vice-versa. Depression is one of the most common behavioral changes overall; it’s been estimated that nearly one-third of all stroke survivors will battle depression during the recovery process. Signs and symptoms of depression may include changes in sleeping patterns, general restlessness, or a lack of interest in activities or hobbies the individual previously enjoyed. Similarly, stroke survivors often experience anxiety or develop anxiety disorders, which vary from a general sense of feeling overwhelmed to long-term complications such as Posttraumatic Stress Disorder (PTSD). Unfortunately, many stroke survivors will also exhibit inappropriate behaviors or outbursts, which may or may not be directly related to the above conditions. Affecting even more stroke patients than depression, the behavioral condition known as Pseudobulbar Affect (or simply PBA) is associated with many of the unusual and unexpected behaviors exhibited by survivors. According to the National Stroke Association, nearly half of all stroke survivors struggle with PBA. The condition is characterized by intense and often inappropriate displays of emotions. It’s important to remember that these visible emotional responses often do not correlate with the way the patient actually feels in a given moment. For example, a person struggling with PBA may suddenly begin laughing when someone is injured, or crying in response to a humorous joke. These inappropriate behaviors may have an overall negative impact on a stroke survivor’s interpersonal relationships, leading to isolation and exacerbating other stroke-related conditions such as depression and anxiety. The stroke survivor should become more aware of the things that trigger these emotions. These triggers will be different for everyone, but they can include fatigue, stress, anxiety and noisy, overcrowded environments. Being around emotional people or events and being put under pressure can also trigger emotions. Every patient will respond differently to a stroke, and not all patients will demonstrate personality changes or inappropriate behavior after a stroke. Nonetheless, there are many proven pathways and strategies for effectively managing personality changes and inappropriate behaviors. Nearly 800,000 Americans will suffer a stroke this year, and approximately one in three of these individuals will suffer emotional difficulties as a result. While many stroke-related impairments diminish with time, these shifts in personality and inappropriate behaviors may be a life-long struggle for countless survivors. Whether it’s increased anxiety or difficulties related to Pseudobulbar Affect, these behavioral and personality changes after a stroke are often frustrating and exhausting for stroke patients and their loved ones. That said, stroke support groups are an effective part of the stroke recovery process for many patients facing these issues. This compassionate, supportive, and nonjudgmental setting gives individuals a chance to both share and listen, enabling people to learn helpful habits and tips from others in attendance. These stroke support groups may also help relieve the feelings of isolation and loneliness that many stroke survivors experience. Simply being around others dealing with similar struggles and emotional challenges is often beneficial for stroke survivors. Additionally, a support group may also allow stroke survivors to learn about further treatment options, resources, and medical professionals in their area. 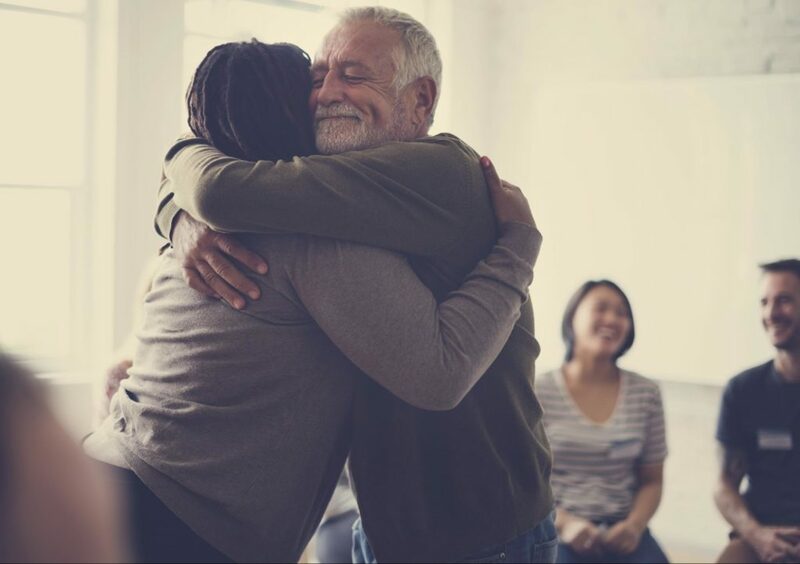 Lastly, It’s never too late to make a new connection, and a stroke support group may be a great place to form a healthy relationship. Just like in life, personality after stroke will continue to change over time. Immediate changes in personality are not always permanent and there are things that can help. Cognitive behavioral therapy helps the stroke survivor identify and change unhelpful thought patterns, creating a more positive and problem-solving approach. Antidepressants may be helpful if depression or anxiety is a problem. It may also be helpful to ask your doctor to review the medicine you are taking. Today, there are many stroke support groups to help patients connect with other individuals experiencing similar challenges. For convenience, the American Stroke Association has created a helpful database where individuals can locate a stroke survivor support group in their area. If you or a loved one has suffered a stroke, consider reaching out to a local stroke support group for help, company, and encouragement. These valuable resources are often right around the corner! Here at Saebo, we are committed to stroke support and recovery for all survivors and their families. Saebo offers a wide range of products that combine cutting-edge technology with evidence-based rehabilitation techniques. Our offerings and network of Saebo-trained therapists can help you or a loved one to obtain all the necessary tools to maximize stroke recovery.